A hot summer's day in Amsterdam. An historic house by the canal. Balloons, cocktail dresses, champagne, smiles and the click-click-clicking of cameras. The beaming couple arrive on bikes, sunflowers attached to their handlebars. 'Yes, I'll marry you, you're the love of my life!' Applause, hugs, kisses, a luscious six-tiered cake with summer berries. 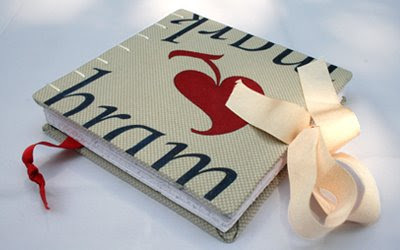 And... a personalized Paperfection gift book, hand-painted with the Trinité font and bound Coptic style. I hope I succeeded in making it more of a guy book than a girly journal by leaving out beads and frills and keeping it simple. The wine, Luscinia Canta, by the way, is a blend of merlot and cabernet sauvignon. It was made with loving care too, by my own sweetheart, in the Catalan Pyrenees. What a lovely story! 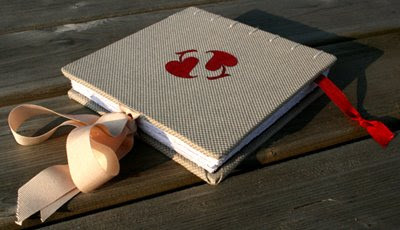 I'm sure your notebook is loved dearly too, it looks beautiful! ohhhh nou mis ik die sfeer; zo Hollands ! Ik vind je boek heel mooi en heel passend ! 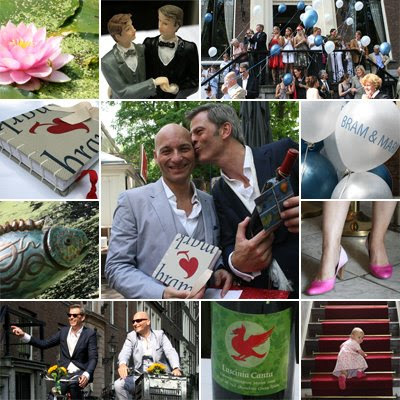 Thanks for visiting my blog...your work is beautiful also...looks like a great wedding. I flew to Amsterdam but did not get to look around...I caught a train to Nijmegen...beautiful country. Thanks Sassy, and you have a reason to go back! I live abroad now, but immensely enjoyed being in Amsterdam again for a day. Glad to know about your loving wedding diaries. Organized a family get together on my father's birthday in a couple of months. Hunted many Los Angeles venues online and booked one also. Will go for Italian and continental food liked by all. Decorations would be sober. Will book the Dj suggested by my colleague.